The RS95 is a premium, british sounding VCO with waveshaping possiblities.The RS95N has a new front panel design with elongated holes. It is based on the RS90 but has more features, predominantly a very special sine wave. The RS95e presented here is technically identical but instead a normal frequency control it features a gorgeous, lockable (!) potentiometer with ten turns. 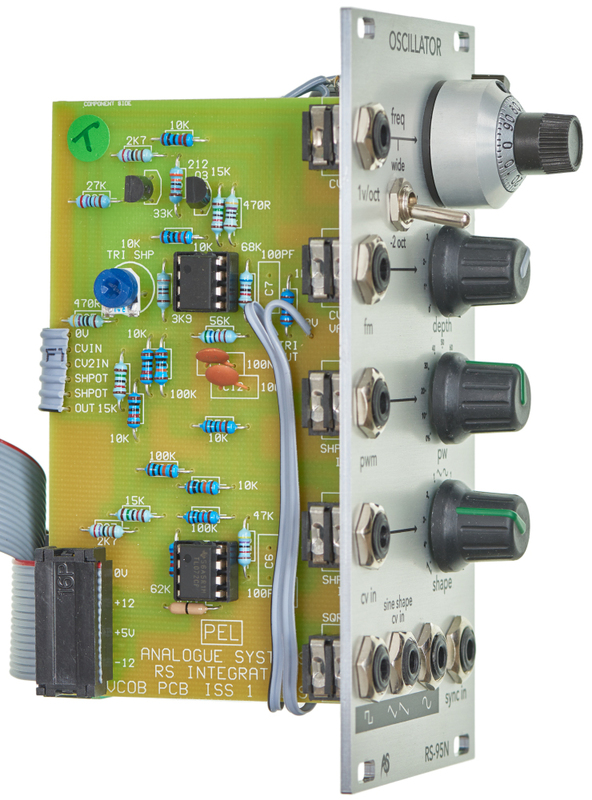 This allows precise fine tune control and adds the look of an EMS synthesizer to the VCO. 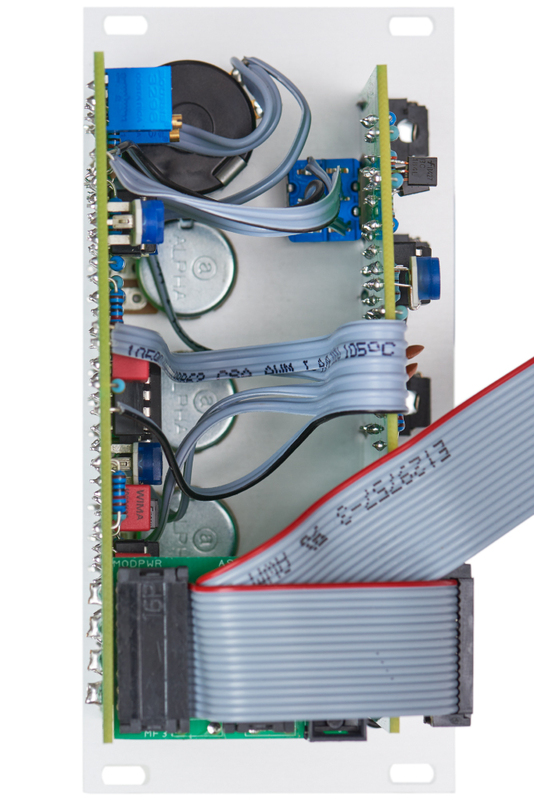 The RS95e has three audio outputs: pulse, triangle and sine. The upper shape control affects the pulse width. The lower shape control not only morphs from a falling sawtooth over triangle to a rising saw (or: ramp) but simultaneously alters the sine wave and produces a kind of smoothed, softer sawtooth. Additionally the saw/sine output is a CV-INPUT for the symmetry of the sine. Very extraordinary feature that all are voltage controllable. 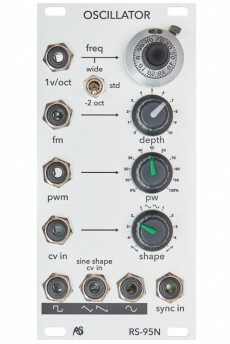 The oscillator sync is "soft" and not only reacts to square waves but works with all waveforms. The frequency control has three switchable modes: STD (standard) with a range of two octaves. -2 is two octaves lower than STD. 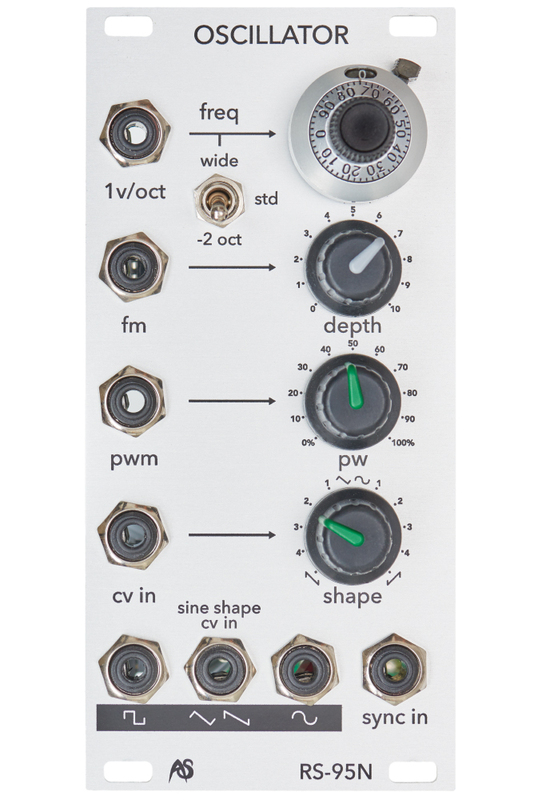 WIDE mode gives a range from 0.3 Hz - 17kHz and thus allows use of the RS-95 as VC-LFO with waveshaping options! The "vary" control not only attenuates but also can amplify the pitch CV. It controls linearly from 0V over 1V/oct to 0.4 V/oct All modules by Analogue Systems come ready to use with five years warranty mounted in the by the customer preferred rack or cabinet.